Star pole vaulter Elena Isinbaeva has had a confidence-boosting win in Stockholm, sending out a clear message to her rivals. The two-time Olympic champion won the latest Diamond League meeting in the Swedish capital. She said afterwards she is on course to reclaim the world title in South Korea next month. The world record holder cleared four metres and 76 centimeters to clinch victory ahead of Germany's Silke Spiegelburg and American Jennifer Stuczynski. 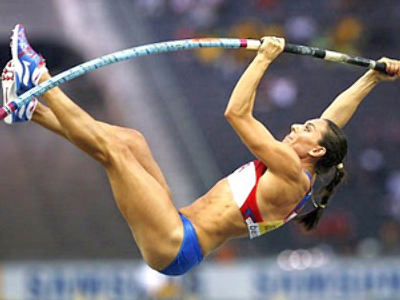 The wind allowed Isinbayeva to put behind her last week’s disappointment in Lignano when she no-heighted. Another Russian star athlete, Ivan Ukhov, saw no rivals in the high-jump. He easily took 2.34 meters leaving the season leader, American Jesse Williams, and team-mate Andrey Silnov, behind. Elsewhere, Usain Bolt cruised to victory in the men's 200 meters in a time of 20.03 seconds. Alonso Edwards from Panama was second with Jamaica's Ainsley White in third. And coming back from a 21-month drugs ban was LaShawn Merrit in the men's 400 meters. The American was happy with his second place finish behind Jamaican Jermaine Gonzales. Christopher Brown from the Bahamas completed the podium. Meanwhile, Carmelita Jeter has proved she still dominates the women's 100 meters, winning that in 11.15 seconds, although there was a strong headwind.